Ok, so today is the day that I do my first culinary competition of the year. My nerves are shot and I am an emotional train wreck. I have been haunted by my lack of Gold Medals in this competition for the past 10 years. (It is a point based system not a ranking system, last year I had the highest number of points but still only a silver medal) So today, in just a few hours, I am going to do my best at getting gold. Below is the recipe for my Rabbit dish. It might seem, to the lay cook, to be missing some instructions. This recipe is written for the professional chef. If you have any questions about how to debone a rabbit feel free to ask them! 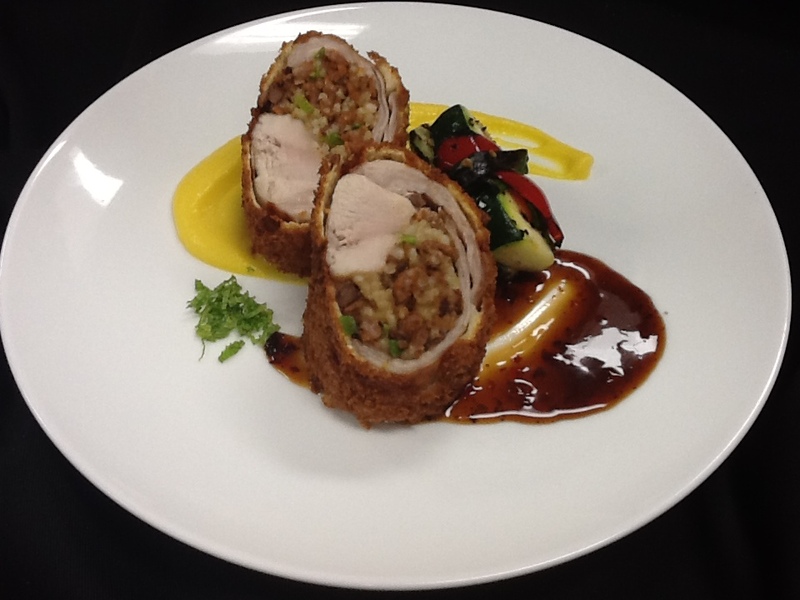 Fried Rabbit Roulade with Pumpkin Puree, Grilled Squash and serrved with a Mountain Dew Ponzu Sauce. De-bone the rabbit saddle. De-bone one rabbit back leg. Lay rabbit saddle and other meat flat on cling wrap. Lay in thin strips the rabbit leg down the center of the de-boned rabbit saddle. Combine rice, chorizo, mint, liver and green onions in a small bowl. Mix well, season with salt and pepper. Add half of mix to the center of the de-boned saddle. Poach roulade for 12 minutes. Chill roulade in ice bath. Remove roulade from cling film and coat in flour. Then roll in whisked egg, then in panko. Then roll again in egg and then again in the panko. Double batter. Fry the rabbit for 7 minutes. Let stand for 4 minutes before slicing. Boil all ingredients until syrup thick. Adjust seasonings with salt and pepper as needed. Rough chop the vegetables in baton-ish shapes. Large enough to grill. Toss with olive oil, salt and pepper. Grill on one side of the vegetable, then flip after 2 minutes. Cook on the other side for 1 additional minute and serve hot..
Half pumpkin. Core and remove seeds. Sprinkle brown sugar in exposed flesh. Season with salt and pepper. Roast, until fork tender, in 350 degree oven. Remove from oven, let chill for 10 minutes. Remove flesh from the skin, add to blender. Add the curry, ½ the coconut milk, cinnamon and then puree. Adjust with coconut milk to desired consistency. Reserve and serve hot. Slice mint leaves, supreme lime. Zest lime, juice lime, toss all together. Use as garnish.